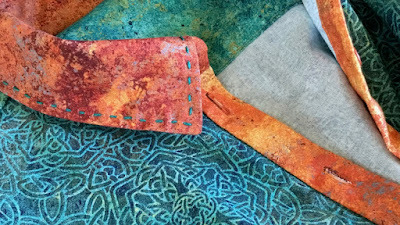 One of the projects on my Make Nine Challenge 2019 list is one that incorporates visible hand stitching. I didn't know specifically what the project would be when I made the list, but trusted that something would cross my work table that lent itself to hand stitching. Here it is. Collar detail on Siena Shirt: hand stitching with 5 wt. perle cotton thread. This is another shirt using my go-to Siena Shirt pattern from The Sewing Workshop. (My third shirt using this pattern.) This time, the fabrics are from Northcott's Solstice collection—a collection of quilting cottons designed to celebrate the 10-year anniversary of Northcott's Stonehenge blender line. 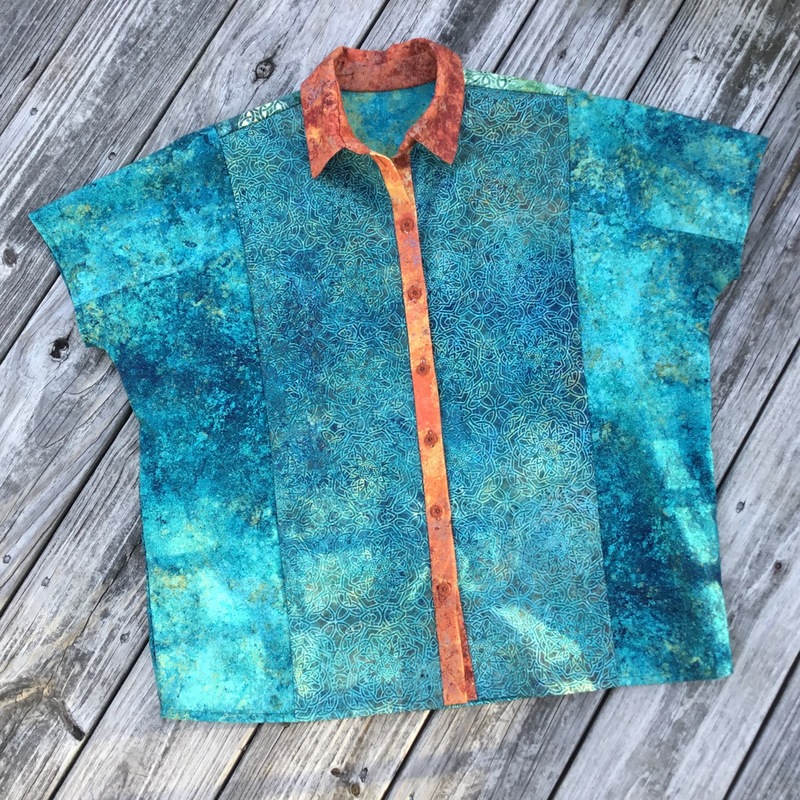 Siena Shirt [The Sewing Workshop] made with fabrics from Northcott Solstice. 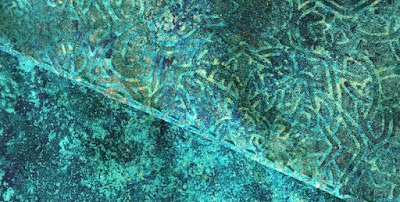 The Solstice color palette is a complementary turquoise-blue-green/rusty-orange scheme with celtic motifs on several of the pieces in the line. It's a beautiful fabric collection in Northcott's top-selling color scheme. Back detail: hand stitches with 8 wt. perle cotton below the yoke. 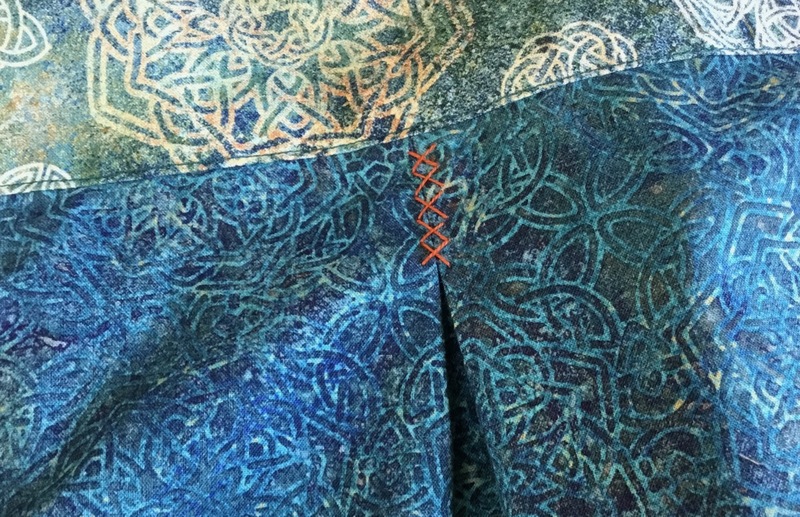 In addition to the decorative stitches on the collar and at the back pleat, I decided to do the top stitching along the seam lines by hand rather than by machine as prescribed in the pattern instructions. Hand stitched top stitching along at a seam. The hand stitched details are done with Eleganza 5 wt and 8 wt perle cotton from WonderFil Specialty Threads.